Sgt. David J. 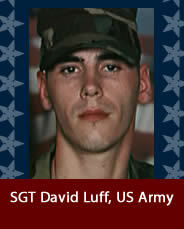 Luff Jr., U.S. Army, age 29, of Hamilton, Ohio, died 21, 2010, in Tikrit, Iraq, from wounds suffered when insurgents attacked his unit with small-arms fire. He was assigned to 1st Battalion, 27th Infantry Regiment, 2nd Brigade Combat Team, 25th Infantry Division, Schofield Barracks, Hawaii.